Joy Creek Photo Archive (c) all rights reserved Euonymus nanus var. turkestanicus is a curious arching-to-cascading shrub with narrow, widely spaced, dark green leaves that march down the stems in a ladder-like fashion. Autumn color is red to burgundy. The flowers are not noticeable but the fruits are relatively large, pink and contain bright orange arils within. 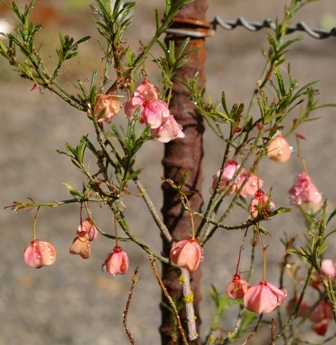 This would be a wonderful shrub for spilling over a low wall or in a rockery. Summer. 3 ft. x 3 ft.